13min walk from Kawaguchiko station or 2 min walk from Ogi bus stop. 3min walk to the lake Kawaguchiko. It is a great way to explore sites in / around Mt.Fuji especially if you have a tight schedule but want to see all! Please check mtfujitour.com for details. and Fujikyu-Highland which is one of the most popular amusement parks in Japan. Cozy,clean,inexpensive and friendly for all you global travelers. 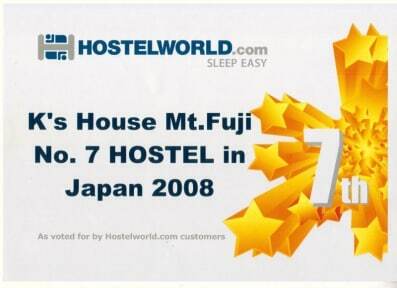 K's House Mt Fuji is fully renovated modern building with Japanese style private rooms and western style dormitory beds . We have individual showers with hot water 24 hours a day. We also offer a fully equiped guest kitchen ,TV room with free DVD movies, darts and board games,spacious cozy lounge, internet access, laundry facilities (washing machine and dryer), Japanese style tatami lounge. Note : All the private rooms we have are Japanese style rooms with tatami matt. 1)Check in / out time. Out hostel has a 2 days cancellation policy. about your cancellation or any changes by 20:00pm 2days before from your scheduled arrival. about your cancellation or any changes by 20:00pm on the day before from your scheduled arrival. * 50% on the day by 11:00am. * 100% after 11:00am on the day or No Show. -We do not accept large group (> 9 people) bookings even if the bookings come from different persons with the intention to form a group in the hostel. We have the right to cancel large group bookings. K's House Ito Onsen opened on Aug 2010 in Ito city Izu peninsula.The 100 years old Historical building with communal and private onsen (hot springs) bath.It is too good to be a truth ! K's House Tokyo Oasis (our 2nd branch in Tokyo ). 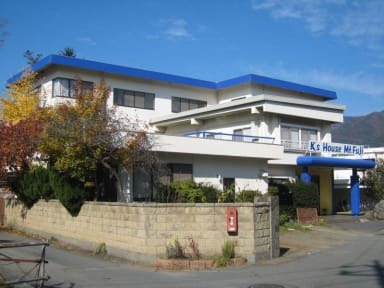 K's House Hiroshima (8min walk from JR Hiroshima statoin) easy access to the peace memorial park and downtown area.